"Winners never quit, and quitters shall be cast into the flaming pit of death." MPAA Rating: PG for for brief mild peril and language. Snow Day. When you were a child, those words were magic. They meant a day of freedom from the mind-numbing oppression and emotional torture that was seventh grade. Freedom from having your lunch money stolen and your face shoved into the toilet. Or maybe that was just me. 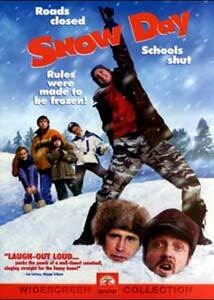 Irregardless, Paramount has just brought us the Nickelodeon masterpiece Snow Day, which I believe will be remembered as one of the best films of the year, a misunderstood jewel like Fear and Loathing in Las Vegas. The film is a surprisingly effective mix of comedy, satire, and raw, human drama. It has been an unusually warm winter, and the kids want nothing more than a day off of school. Little Natalie Brandston (Zena Grey) sits up all night wishing for escape from her tedious life in the fifth grade. Meanwhile, her father Tom (Chevy Chase, in his triumphant return to film after 1998's Dirty Work), weatherman at a struggling news station, is facing pressure from his boss, Tina (Pam Grier, in her triumphant return to film after 1997's Jackie Brown), who wants him to scare viewers by reporting the weather with no pants on. Or maybe it was supposed to drum up ratings - the Mamet-inspiried dialogue is a big difficult to understand at times if you don't have Webster's handy. On the home front, Tom's workaholic wife, Laura (Jean Smart) has been neglecting her familial duties in her power-mad struggle to break through the glass ceiling of whatever exactly her job is supposed to be. When the big snow storm finally hits, the main plot of the film kicks in. Natalie has gotten her wish, but she must face the loss of her childlike innocence as she battles the sadistic Snowplow Man (Chris Elliot, in his triumphant return to film after 1998's There's Something About Mary), who is bent on terrorizing the town's small children until either the snow day is called off or the cops pick him up for hanging around the playground a little too long. Elsewhere, in what is perhaps the most touching romance ever put on film, Natalie's brother Hal (Mark Webber) attempts to woo the naughty girl Claire (Emmanuelle Chriqui), when all along, the perfect girl was right in front of him—best friend Lane (Schuyler Fisk). Wackiness (and tenderness) ensue, and it is all sure to work out in the end. But there is still the problem of Natalie's frequent hallucinations. Featuring a stunning cameo by Iggy Pop that tops his work in Rugrats as well as the impressive film debut of Chile from pop group TLC. With such big names, you know the film is great. This film did well with kids at the box office, but I believe it deserved a much larger audience. Besides the already mentioned multi-layered screenplay, the film was so brilliantly directed that it is hard not to gasp at the genius of Chris Koch. In Gilliamesque tradition, Koch blends mind-warping imagery with brilliant set design (check out the overly elaborate snow fort) and colors bright enough to provoke acid flashbacks. The tone of the film is really unusual, and shows a keen eye and ability to hold back when necessary. I wouldn't be surprised to see Koch walking away with a little gold statue come March. As good as the direction is, the acting is better. Chevy Chase is, in a word, brilliant. He gives his character such dignity - When you see him sliding down the hill dressed as Frosty the Snowman, you will laugh through your tears as he confronts his demons and faces his fears. Pam Grier tops her Jackie Brown role with the all to brief turn as the Network inspired, power-hungry newswoman. All of the youngsters in the film are great as well. It amazes me that the director got such powerful and devastating performances out of children so young. Whatever doubts you may have about the film, forget them. It was woefully mis-marketed to young children only. Sure, it is an excellent movie for them, but only an adult could fully grasp this nuanced and intricately plotted little gem of a film. See it, trust me. Image Transfer Review: I don't know why people even bother to review Paramount discs for new releases. As always, the anamorphic picture is near flawless, with amazing depth of field and very bright colors (as you can imagine a film like this uses a lot of color). I noticed no edge enhancement and just a touch of artifacting on some of the plaid snowsuits the kids were wearing. Another excellent Paramount release. Audio Transfer Review: The sound mix here is very good for a comedy. The dialogue is always crisp and clear. As is usual for this type of film, the mix is a bit front-heavy. However, in the scenes with Chris Elliot and the snowplow, the LFE kicks in quite a bit. The surrounds are used well when the big snowball fights occur as well—they fly in from all angles. Really, this mix is better than it should be. Kudos to Paramount. Extras Review: The extras package for Snow Day marks another rare special edition from Paramount. They've been putting more and more features on discs lately, and the fact that they put a commentary and three featurettes on the disc just proves their commitment to the format. The commentary with Director Chris Koch and Screenwriters Will McRobb and Chris Viscardi is particularly enlightening. They reveal the film's harrowing journey from the script to the screen- apparently the director envisioned a much bloodier and shocking film than the final product. It is entertaining throughout. I was especially interested in the revelation that they forced a child actor to eat asbestos (I am NOT kidding). The disc also includes several short featurettes. The 10-minutes of interviews with the actors are good- it was strange to see the child's point of view on the making of what is sure to become a classic. Behind-the-scenes "Nickclusives" (which originally aired on Nickelodeon), offer four brief bits of trivia from the making of the film, from the creation of the snow effects to the brilliant character-study that was the performance of Chevy Chase. Finally, the 12-minute "Snow Day Scoop" featurette (which also aired on Nick) basically reiterates and expands upon the same nine video clips we've seen already. Sadly, the video for the film's big hit single, Another Dumb Blonde, was not included. The video, which was in heavy rotation on MTV last winter, featured Don Ho's daughter Hoku and both her lack of any singing talent whatsoever, and her amazing prowess at looking cute in fuzzy sweaters. The extras package here is good, if a little on the promotional side. However, I believe this is the best version of Snow Day we are going to see, unless Paramount sees the light and lets the director re-edit the film to include all of the violence and swearing that was cut to receive a PG rating. Let's just hope they include the fabulous Hearts of Snow: The Making of Snow Day documentary. Snow Day works on so many levels. In one way, it is a perfectly pleasant family film, one that you can show your children to keep them busy when they actually do get a snow day. The reason the film really shines, however, is because it blends so many brilliant moments of broad comedy, heartfelt drama, and brilliant satire. The performances by Chase, Elliot, and Grier are, in a word, masterful. This film will touch you in ways you didn't know a film could. Ok, in all honestly, this is a perfectly fun little family flick that occasionally swerves into some really whacked-out humor. This could be contributed either to the Nickelodeon mentality or the fact that the writers obviously smoked about a pound of hash before staring work. In any case, it is pretty fun to watch. I suggest letting the little-ones view it, then carting them off to bed, sitting down with a 12-pack, and re-cueing the disc for yourself.